Early this year, Tune-Yards returned with the project's I can feel you creep into my private life, and just in case you forgot about it already, the group have treated us to a new video. The clip is for album track "Honesty," and it was directed by Susan Janow from Creative Growth, an organization dedicated to providing a professional studio environment for artists with developmental, mental and physical disabilities. 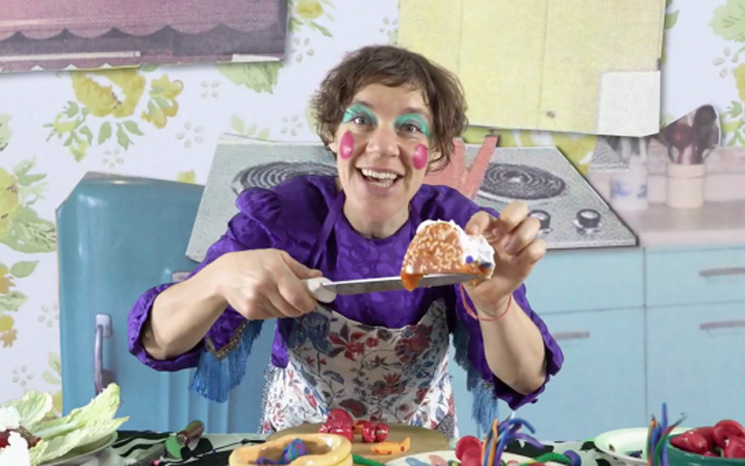 As you'll witness, the results find Tune-Yards' Merrill Garbus as a '60s housewife who takes a seriously wild trip to the grocery store. Susan's concept for the video played artfully against the lyrics of the song — I loved her idea of a bored, sheltered housewife having an ecstatic psychedelic experience involving weird jello food and lots of pizza. The topics of this album are heavy and light at the same time, and I'm so glad to have a video that brings out its joyful, dada side. Check it out for yourself below, where you'll also find a making-of video. I can feel you creep into my private life is out now via 4AD.